Tom and I visited four schools over Thanksgiving break while he had off from work. We went to three private Chrisitian schools and one public school. 1 – We are zoned for Lansdowne Elementary which is a partial magnet school. This means that half of the school is zoned for it and the other half elects to send their child there. The entire school is taught the same curriculum: international baccalaureate. Sounds fancy, but to me it seemed like your typical public school. Maybe it was the surroundings – older school with a mix of free lunch and magnet students. People have told me that it is a great school. If we could not send her elsewhere, we would have felt ok sending her to Lansdowne. 2 – The next school we went to was Covenent Day School in Matthews, NC. I decided to tour this school because it is close to our house and have heard good things about it. We loved it!! Our tour was phenomenal. We were very impressed with the Biblical teaching, the curriculum, class size (18 max), the music teacher and the art teacher. Almost every class that we walked into was well behaved and the teacher came out to chat with us. The art teacher talked our ear off, but it was evident that she loved her job and could translate how a child expressed themselves with art into the regular classroom. We left that school knowing that Faith would go there next year. It was “abundantly clear”. 3 – The next day we visited Carmel Christian and Arborbrook Academy. Carmel Christian is where we thought that we would send Faith. I have learned over the years that I can’t just assume that I will do what my aunt or friends do. I have learned that I need to research the subject myself. Too many times I have just gone with others’ decisions so that I don’t have to do any leg work myself. This is one of those instances where I am glad that I did the research myself. Carmel is a great school, but it was clear that she was not to attend there next year. 4 – Arborbrook Academy is a close second to Covenant Day. If it were closer to our house it may have been a much more difficult decision. It is a well known fact that I do not like to drive more than ten minutes in the car before I say, “It is too far”. This would have been a 20 minute drive each way. Not going to happen! It is a cute school. Classes are very small and we would homeschool on Fridays. The school’s philosophy is based on Charlotte Mason’s philosophy of school – children are to reading living books and to learn from nature. A great philosophy and later on down the road, it might be the school for us, but not next year. 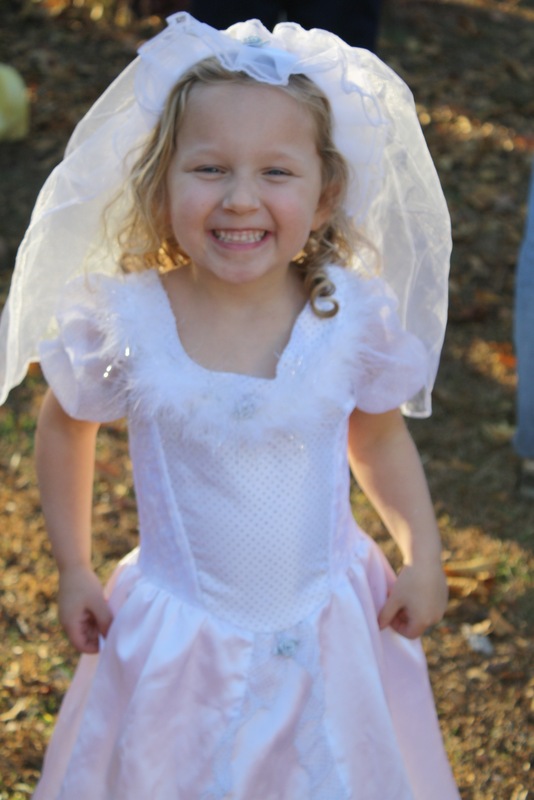 So, after all of that explaining….Faith will be attending Covenant Day School in Matthews. We are excited for her. Of course, in my typical, indecisive way, I still am doubting my decision, but know that it is the only choice that feels right. 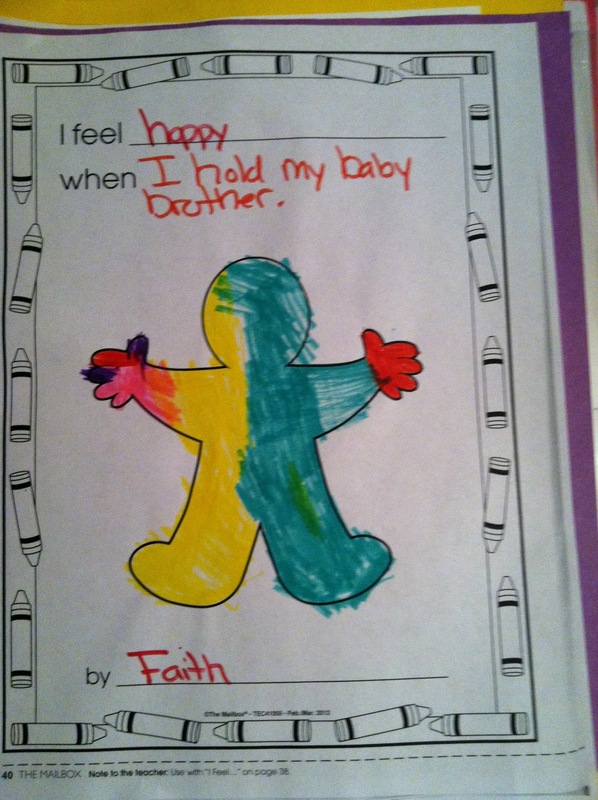 This entry was posted in Uncategorized and tagged covenant, Faith, kindergarten on November 29, 2012 by Becca. Sometimes I am afraid that Wilson doesn’t get as much billing around here as the rest of the kids. Maybe there really is a middle child syndrome. I can see how it would happen: You do all the normal things for the first child (baby books, pictures developed, etc). But then you have the second child and get totally overwhelmed. You can barely brush your teeth, much less keep up with a baby book. But then you finally get a system for life and can somewhat juggle a 1,000 things at once. Then….you have a third child. By now, you are used to having a chaotic life and can now go back to being able to keep up with baby books, and maybe even add a blog into the mix…. Wilson, however, could never be overlooked. He is too funny and entertaining! Lately Wilson has been doing puzzles and he is getting very good at it. He is one to practice and practice a skill until he gets really good at it. Puzzles are one of those activities. 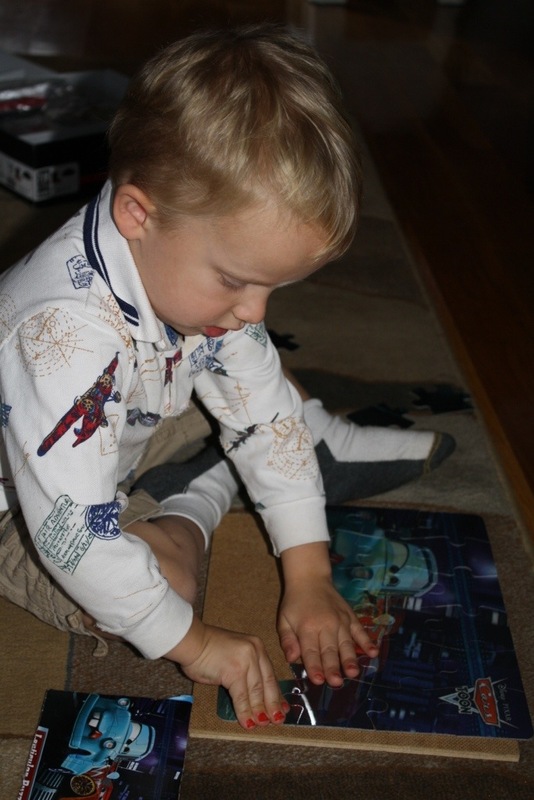 He loves his Cars puzzle, which is actually a lenticular puzzle, a word which I just learned. It means it is one of those puzzles where the picture changes depending on which angle you look at it. It makes a very difficult puzzle for kids to do, but he gets it. Here he is with his puzzle. notice the red finger nails…. Tom’s pants on his head! Hilarious. How does he think of these things?!? 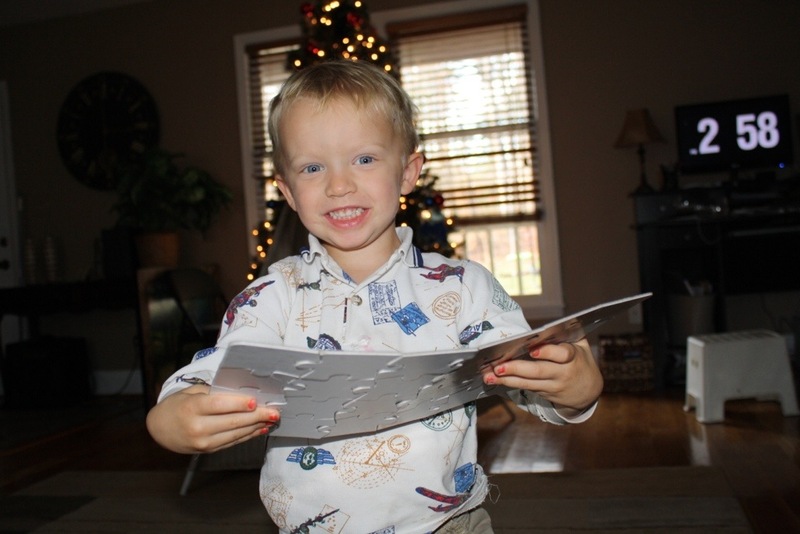 This entry was posted in Uncategorized and tagged puzzles, wilson on November 29, 2012 by Becca. Last night Faith and I were going through some of her things and we found her portfolio that Miss Kerry kept of some of her work from preschool last year at Cross and Crown. Faith attended the cutest little school last year. Some of her work was pretty good for a four year old. This is what she wanted for Christmas. 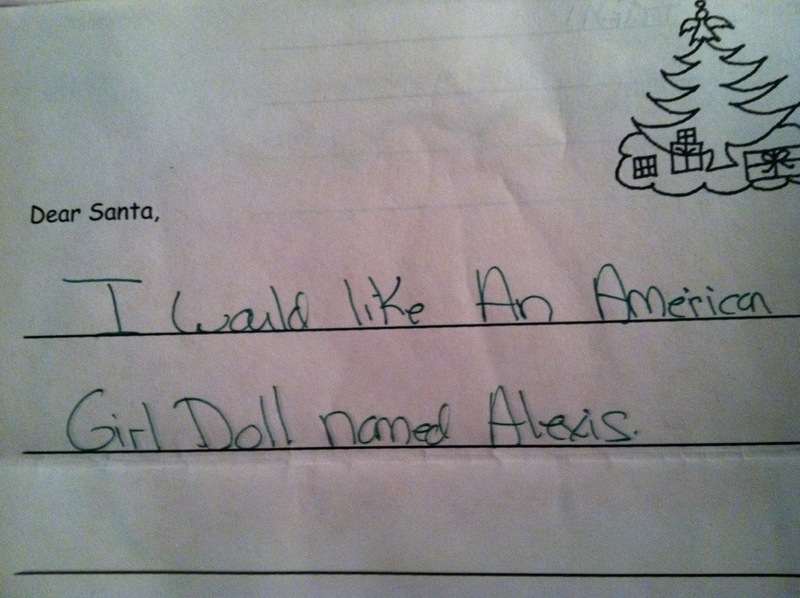 She would name her doll after her cousin. She loves her baby brother, Miller. A Family Portrait. 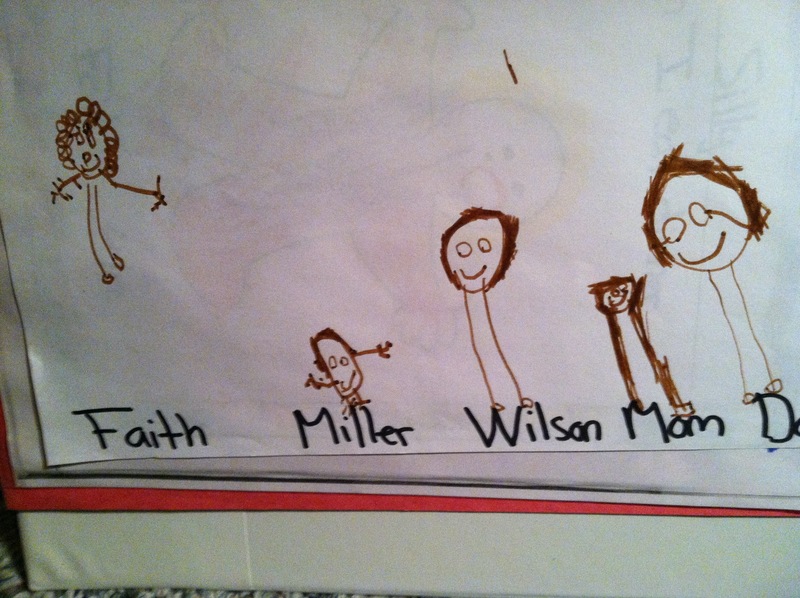 While looking at this one, Faith started to laugh and said, “I made Miller have chicken feet. I don’t know why, but I did.” I think he looks like Mr. Potato Head. This entry was posted in Uncategorized and tagged Faith, preschool, school, work on November 25, 2012 by Becca. This year for Thanksgiving we went to my mom and dad’s house. This is actually the third year that we have had a huge family Thanksgiving over there. By huge, I mean that the entire Wilson clan was there: Alan, Betty and their kids, the McCullochs, Doug and Jacqueline and their kids, Sandra, Robert and Grandma, my family, Brian’s mom and Mr. Lee, and usually Big Doug (but they didn’t make it this year). Side note: We didn’t make it last year because Miller was only three days old. Believe it or not, we went for about an hour last year and took food to go. 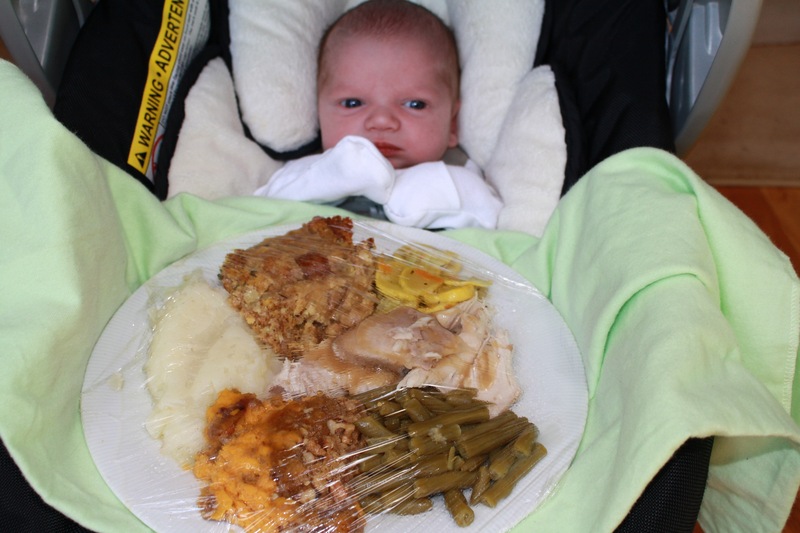 Here is Miller with our food last year. This year we decided to go to the Thanksgiving Day Parade here in Charlotte before we went to mom’s house. We met Doug and his family there too. It was a lot of fun! It seemed that almost every group was either a marching band or a car with beauty queens in it (which Faith called “princesses”). It was perfect. We really enjoyed spending some fun, outdoor time together while showing the kids something new. After the parade we headed to moms house, ate a ton of food and talked a lot. 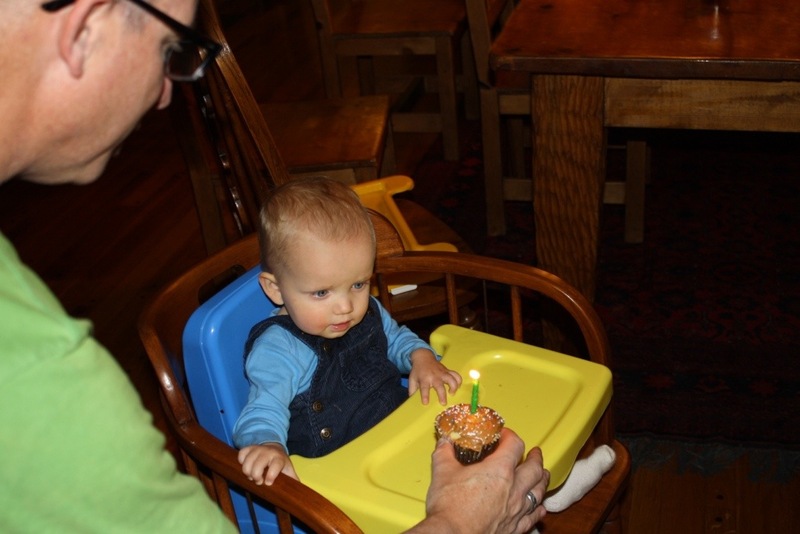 I decided that since Miller’s first birthday was the day before Thanksgiving we would celebrate it on Thanksgiving during dessert. Why not? We already had a big party’s worth of people! I made some cupcakes and we all sang Happy Birthday to my sweet Miller. We actually had to sing it twice because Wilson missed the first singing and he had been waiting for it all day. 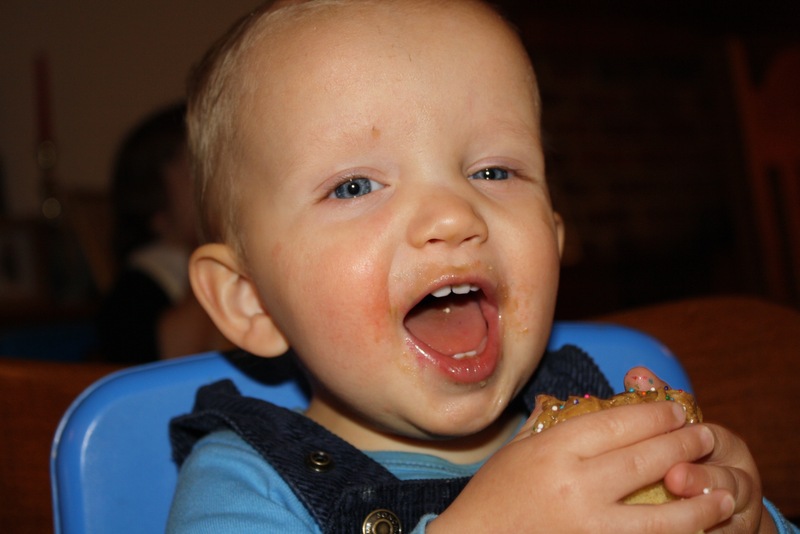 Miller loved the cupcake, and why wouldn’t he? Pointed and begged for more later on. Here he is eating and posing for the camera with family. After eating some of us went into the backyard to play with the kids and get some fresh air. 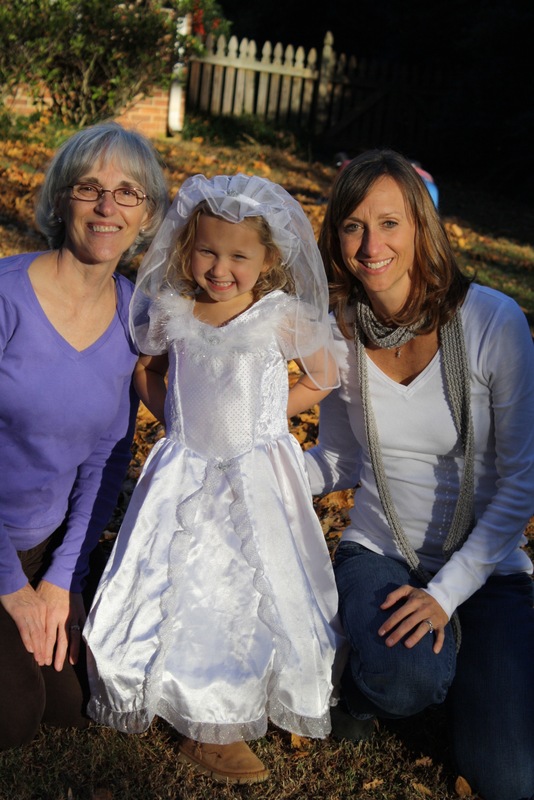 Faith came out dressed up as a bride….I think Tom had a small panic attack at the sight. I hope that I remember to thank God everyday for my family, friends, health and home. Did you? 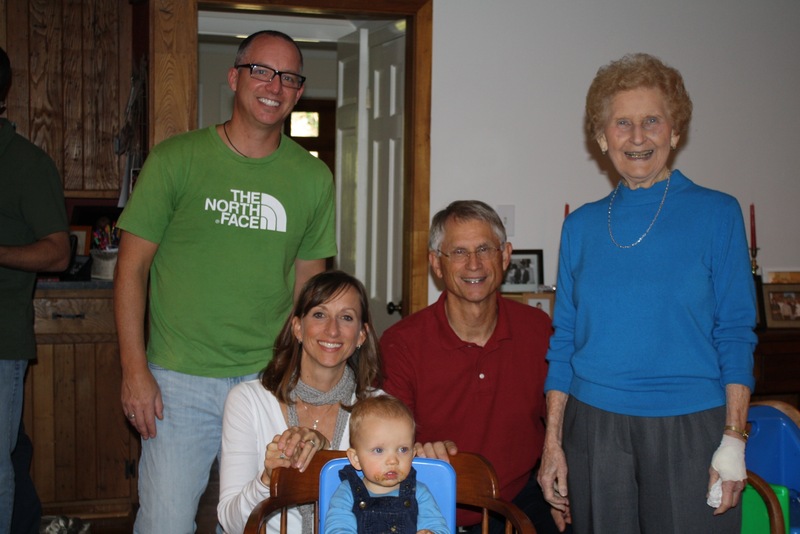 This entry was posted in Uncategorized and tagged thanksgiving on November 22, 2012 by Becca. My baby is one-year-old today. I can’t believe that it has really been one year already. The past year has seemed like a second and an eternity, both at the same time. I like to call Miller either “my cherry on top” or “my grand finale”. Both are accurate. I gave birth to him at home so he really was a “grand finale”. He is also my last baby on the sweet sundae that is my life and kids. He really is the sweetest thing. (I know that I write that all the time and I am sure that everyone thinks that their baby is the sweetest.) He is funny too. He loves a good game of peek-a-boo, playing with cars, and pulling all the tissues out of the tissue box and stuffing them back in. Today he received a box in the mail with gifts for him for his birthday. In true baby fashion, he pulled the tissue paper out of the gift bag and then played a long game of “put the tissue paper back in the box and pull it out again”. Too funny! Eventually he did play with the toy car that was in the giftbag. Miller is a true blessing to our home. 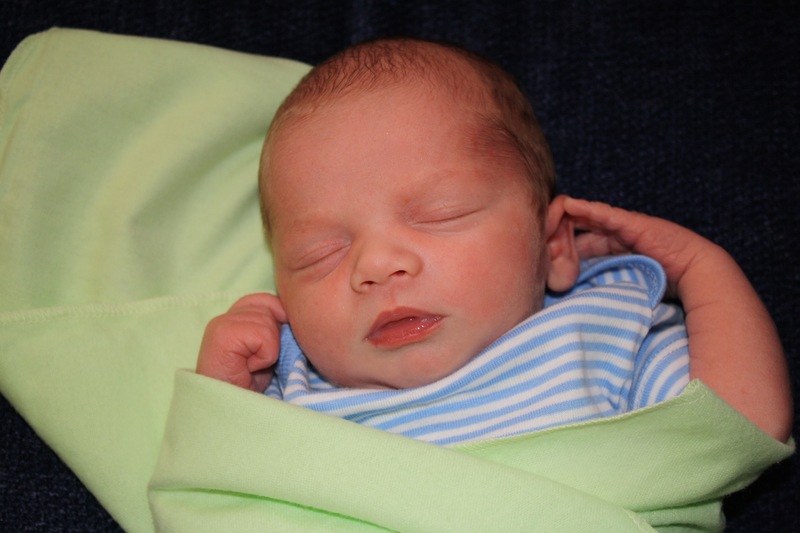 While he was still in the womb I prayed that God would give us a peace maker and a calming sense to our home. God has answered that prayer. I am so blessed to have three fabulous children. 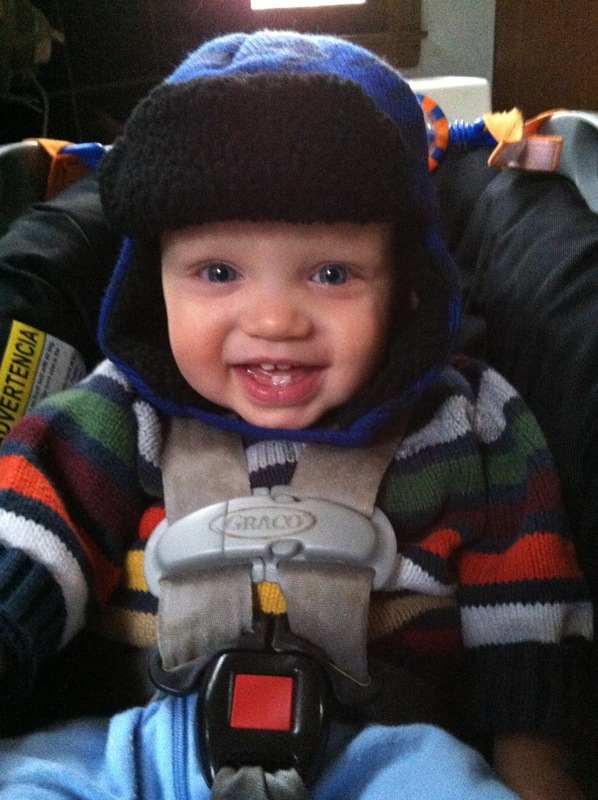 Here is Miller in his new hat on his birthday. While I was trying to take the picture he kept saying, “Hey!”. He also says, “Uh-oh”. His two first words. 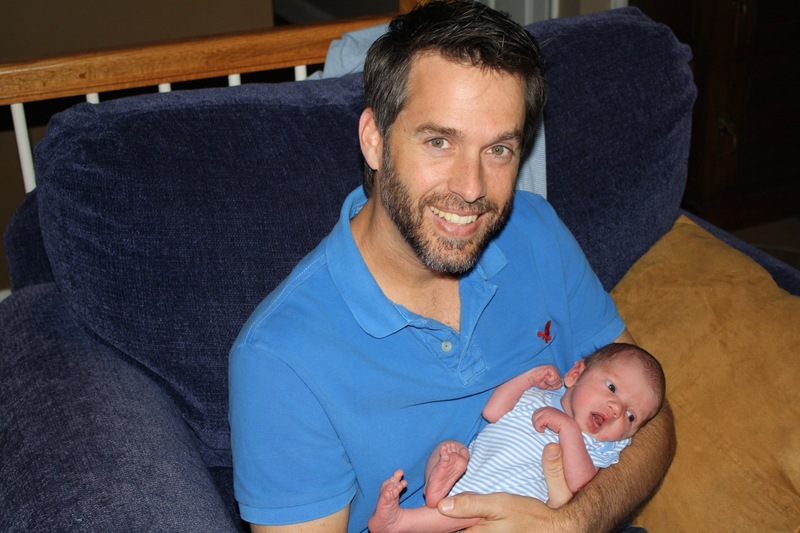 Here are some of my favorite pictures of Miller in his first week of life. There are so many more…. Because he was born three days before Thanksgiving, we couldn’t stay at mom’s too long. We did manage to stay long enough to say “hi”, show off the baby, and get some good grub to-go. We even had a nifty place to hold the food…. Here is Miller with his Uncle Doug. Miller was such a peanut! This entry was posted in Uncategorized and tagged birthday, Miller, one on November 21, 2012 by Becca. 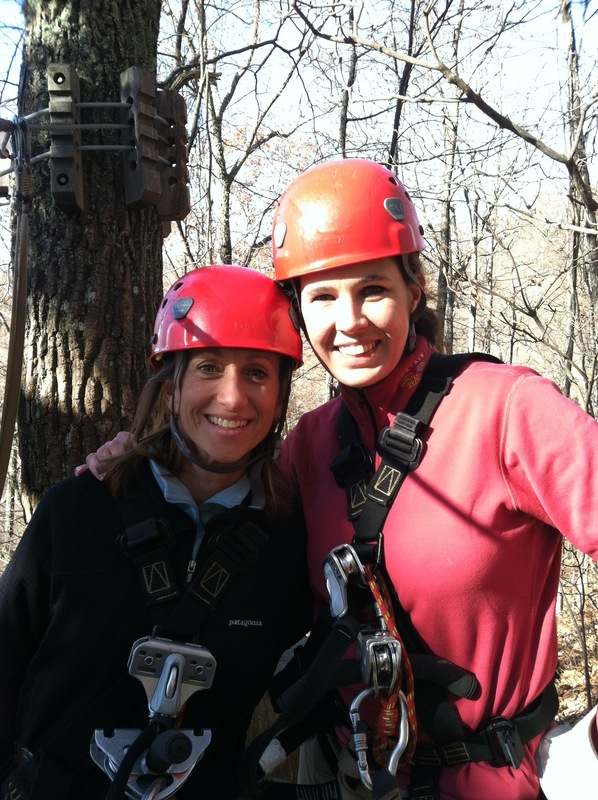 Today I went with my friend Sidney to Navitat Zip Line Canopy in Asheville, NC. It was so much fun. 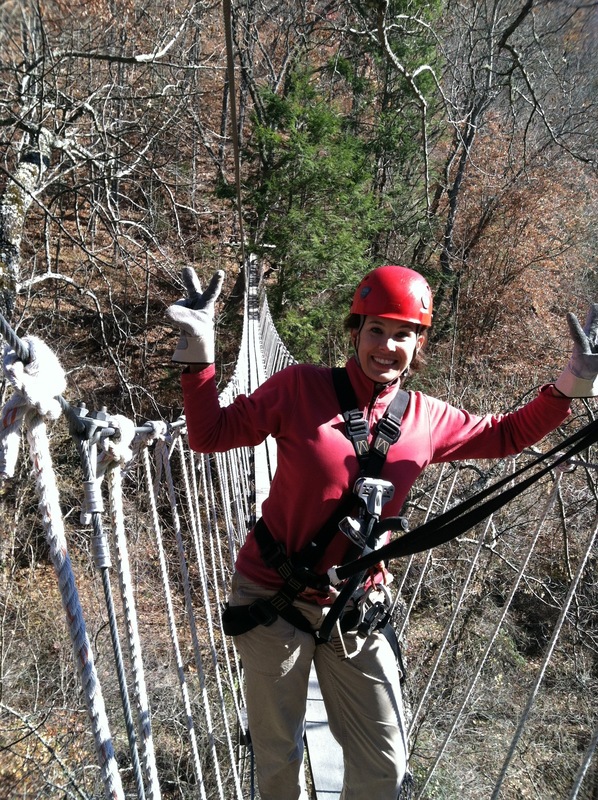 The course had ten zip lines that were, at the max, 200 feet up in the air, 1050 ft long, and zipping up to 40 miles per hour. The two longest ones were super fun and fast. They got us used to the zipping and stopping on much shorter lines, but they increased further into the tour. 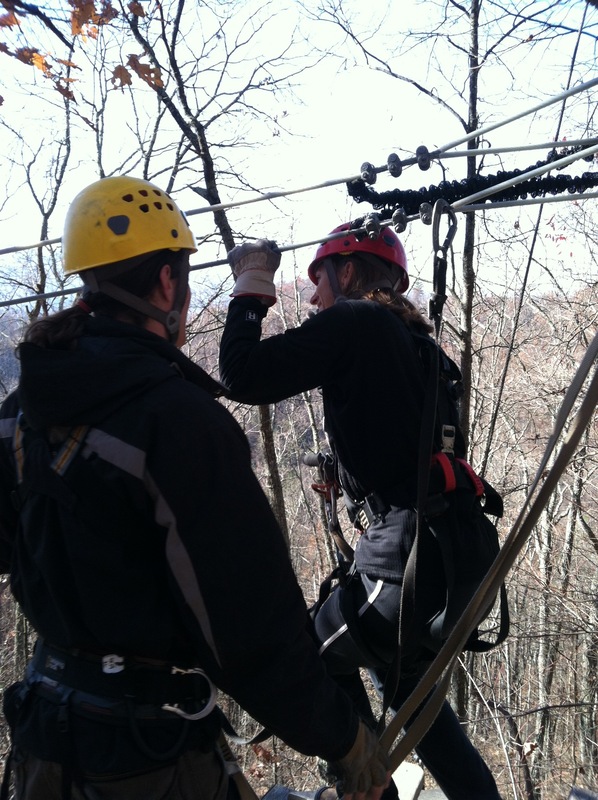 I had never ziplined before and was definitely a little afraid at first. Heights are not my thing, but by the end of the tour I was stepping off the platform without a thought and stopping like a pro. The second longest one was my favorite. I actually “whooo”-ed through part it….it was awesome! I could look to the left while zipping and see the mountains and the beautiful scenery. Because all of the leaves had already fallen, we could really see the view all around us. This was a great activity. Between this and the mud run, I am feeling more alive than ever. What is next? Skydiving? Maybe…. Me getting ready to zip for the first time. Standing on the platform debating whether or not I want to step off..
Me and Sidney before the first zipline. This is actually our instructor going across the longest one. Whooooo! 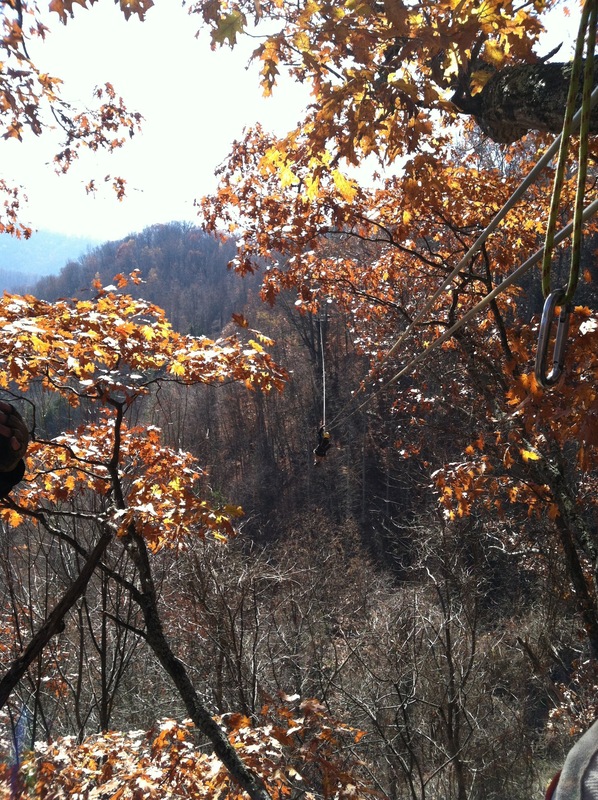 This entry was posted in Uncategorized and tagged line, navitat, sidney, zip on November 17, 2012 by Becca. Tom and I are on a mission this week: to find the right school for Faith to attend kindergarten. This is a big deal for me. My baby is going to kindergarten. There are a lot of choices of schools in Charlotte: magnets, public, and private Christian. We are looking at five schools in particular, three private Christian schools and two public. One of the public schools is supposed to be the number one elementary school in the county but we would have to move to attend it. Lansdowne Elementary is our current home school. We visited it this week and it was an okay school. Nothing stood out about it, but there wasn’t anything negative either. It is considered a partial IB magnet school, but the curriculum didn’t blow me away. I like that they teach Spanish. I don’t feel that God is saying, “send her there”. Next week we visit the private schools. The only draw back for those is the ticket price. We have three kids which means that the cost really begins add up in four years when they are all in school. Eek. The education is worth the price tag, but do we really want to do it? That remains to be seen. 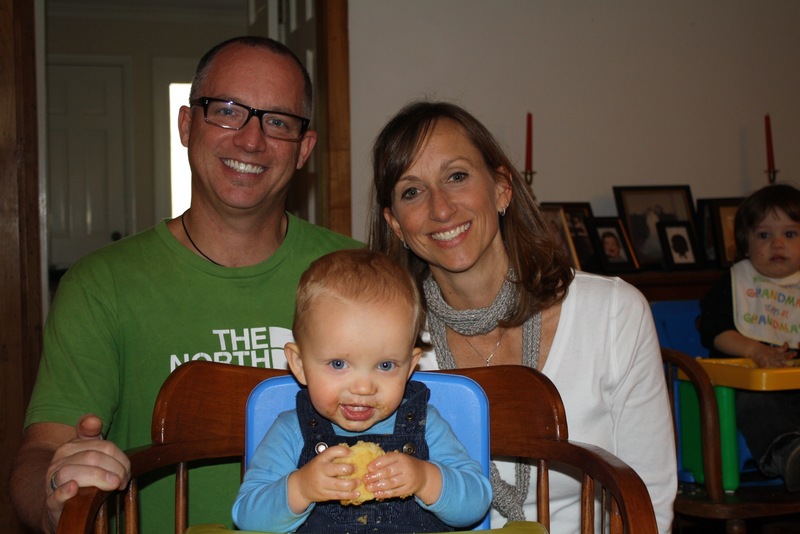 We are praying that God makes it abundantly clear where we are to send our baby girl to school. I hope to know next week so that we can either begin to save money or begin to sell our house. 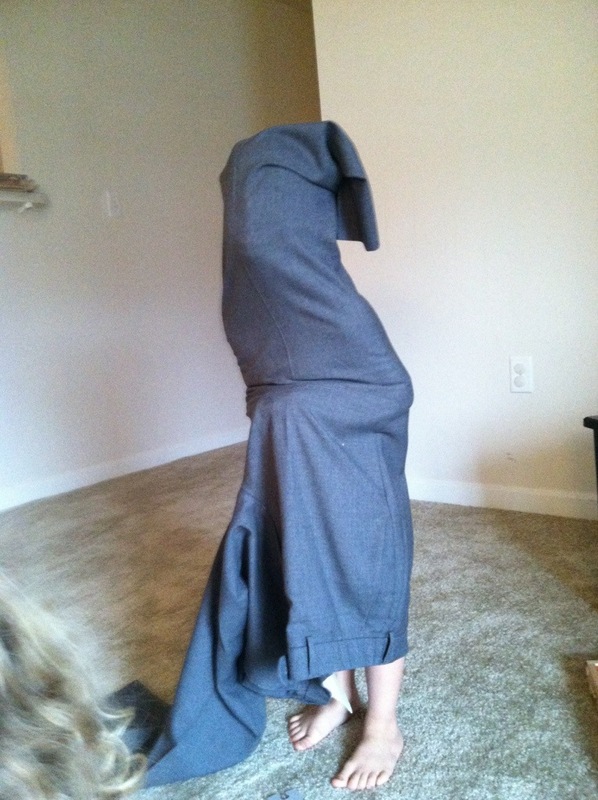 This entry was posted in Uncategorized and tagged kindergarten on November 17, 2012 by Becca.